Here goes my first real opinion blog post. I don’t feel like these will happen often but here it goes! I love makeup! I love the different things I can do and the confidence it gives me. I have had on and off acne my entire life and mix that with skin that scars very easily… you get the picture. It has taken a lot of my 20’s to gain confidence to go into public with no makeup on. I am usually one that is willing to try something new before it is a trend. There are TONS of makeup/beauty trends right now that I LOVE but there is one that’s become popular that I am not interested in trying and it is make up contouring! Now some people contour wonderfully and they accent their favorite features. However, SOME PEOPLE ARE UNRECOGNIZABLE! To me this makes no sense…. everyone is beautiful and yes we all have some features we don’t like but to change your entire face with makeup just seems so sad! This one is subtle and accents the woman’s features. Love how it plays up where light would hit your face! Now THIS is something I would be willing to try! Here is one where the young woman even admits this makeup being deceiving! Now some of the ones below are alright but some don’t even look like themselves…. like the 1st and 4th. I am not trying to be judgmental as the women are all beautiful in their before and in their after. My hope is that they are comfortable in their own skin and are just contouring for fun, not trying to hide themselves. I love fashion and watching the latest trends but I am also aware of the pressure it puts on women to look a certain way. As much as I want my 5’2″ frame will never be super model height… I learned long ago to embrace being petite! 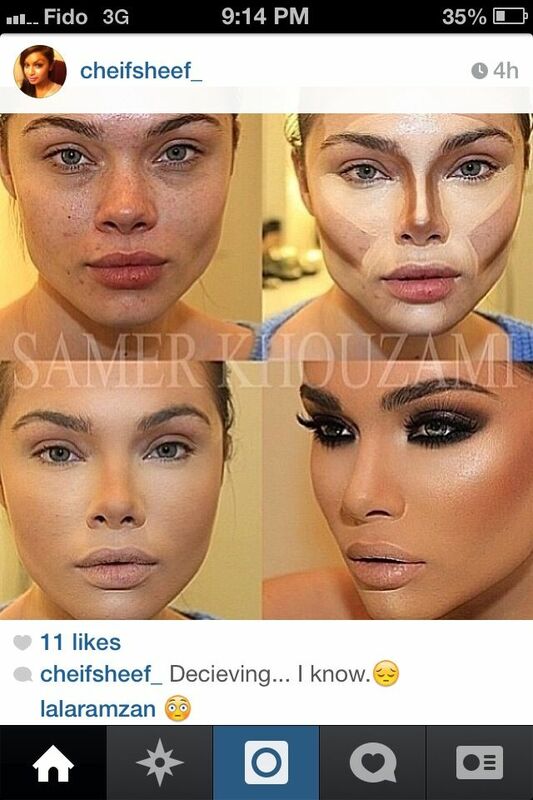 So with that I just think some of this makeup contouring has gone haywire! Love the skin your in people and use makeup to accent your beauty not hide it!